Of all dog fences you can choose from, portable models are probably the most flexible. They can be set easily at any location you want, while also allowing you to customize the perimeter. A portable dog fence will be durable and affordable at the same time. As such, considering them is a wise decision. As we prepare to buy the portable fence for a dog, there are a few things that play the biggest role. In the later part of this article we present seven most important factors. Keeping your pet safe and well-protected is mandatory and the most important goal of most dog owners. 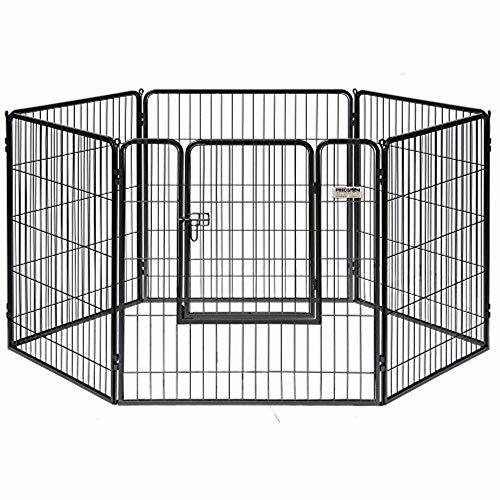 This may be the main purpose of a metal pet pen but it definitely isn’t the only one. As a matter of fact, we have plenty of other purposes, something we will mention below. When you travel with your dog, think about where he will stay while you are comfortable in your room? Yes, it is possible to stay with your dog in a hotel room, but when you are visiting a relative with a backyard, you should allow for your pet to stretch his legs. Portable outdoor dog fences are just perfect for this application. They will keep a dog safe and still allow him to enjoy in wonders of open space. Dogs are curious creatures and in the wild, they will try to explore and to check out new and interesting things. Sadly, this is the main reason why so many dogs get lost while camping with their owners! In order to prevent that and protect your pet, carry a portable pet fence. It requires less time to be set than your tent, but it will keep your dog safe from getting lost and keep wild animal safe from him, just in case he is a big dog! Portable dog fences are a perfect solution for camping; they are lightweight, so carrying won’t be an issue. Let’s think of the following scenario. You have a large backyard but you don’t have a fence. You also have a dog who will enjoy that backyard, but it isn’t very safe to let him loose there. The ultimate solution is the outdoor temporary fence. Keep in mind that the size and the shape can be customized at any moment, allowing your pet to maximize your backyard. When in a controlled space, dogs learn potty training much easier. Almost all experts recommend potty training with dog fences. Here we have one of the main reasons why dog enclosure is so important. It will protect your dog from people who may harm him and from other dogs who may do the same. For female dogs, this type of fences is even more important. If you don’t want puppies, using a fence is more than just mandatory. Important: Male dogs are very aggressive during the mating period, so you will need a strong and durable fence when you want to protect your female dog from unwanted puppies. 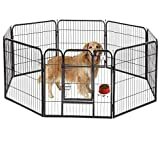 When you want to limit the movement of your dog indoors, using a pet playpen is the best choice. Most dog owners will want to restrict the movement at some point, so using the fence is simply the matter of time. When considering the portable fences for your dog, there are a few things that you should take into consideration. These seven simple points below will allow you to get the most suitable model for your needs. Because we are focused on portable fences, obviously the weight matters. But, if you are going to use a fence in your backyard for some of the mentioned circumstances, the weight is the second most important factor. In both situations, the size is the main thing to consider. 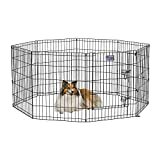 Of course, the size of your dog should be considered, but even for small dogs, a large portable fence is perfect. In simple words, larger the dog, larger the fence should be. Height is another factor to consider and here’s why. Some dogs have natural ability to jump really high. For example: Border collie, Russell terrier, Australian shepherd, Australian kelpie, Standard poodle, Shetland sheepdog, etc. That is why in order to keep them at the certain area you have to get the high fence. However, there is another factor that is worth to take into consideration. Most dogs will like to dig holes or even tunnels. Yes, they are quite good at digging tunnels, so you will need a higher fence, in order to dig it into the ground. The depth should be chosen according to your dog’s ability to dig. Those who prefer tunnels must be secured with fences, dig in deeper in the ground. On the other hand, those who dig holes will be perfectly safe with fences which don’t have to be dug deep. Setting up the fence: How simple it is? Obviously, all dog owners need fences which are easy to set up and the entire job can be done in a matter of minutes. There is no general rule, therefore it depends on a particular model. However, most of them can be set within 10 minutes. Once you get a better idea how it works, you will need even less time. Aim for units which don’t require tools for setting them up. Where will you place the dog fence? For outdoor purposes, you should consider wired models, made from steel and coated with a protective layer. Only then you can expect a long-lasting fence. For indoor applications, you will need a dog pen which has smaller dimensions and is made from wood or plastics. How strong your dog fence is? A build quality is actually determined by the temperament and size of your dog. Larger dogs must be secured with a large and fence made from steel or iron. The same applies for aggressive or too ‘’happy’’ dogs. 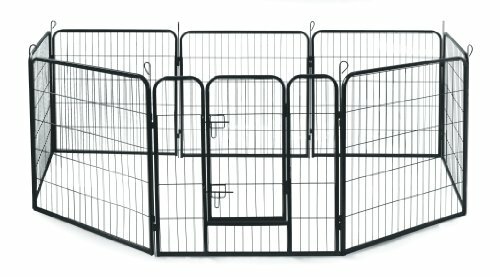 Steel or wired portable fence panels are simply the best. Almost all of them are treated with an anti-corrosion coating, so the elements won’t harm the construction of the fence. There are models made from plastic, wood or even fabric, but they are mostly oriented towards indoor usages and for small dogs. In this situation, the design refers to the shape of a fence. Yes, square models are the most common and they are easiest to set but don’t be so straightforward. Nowadays we have fully customized models which can be set in any size a dog owner will need and the shape can be adjusted accordingly. For indoor-base models, the design also refers to the simple looks of the fence. You will need one which matches your décor. Which type of fence is the best? The answer probably depends on your requirements. Wireless models can be set literally in 1 minute, but they will require time to train a dog. If a dog has problems with wearing a collar or you don’t like electric shocks, then you will have to opt for another type. But, when you are focused on the amount of space the fence is giving, this type of is recommended. Portable dog fences can be easily set as well. They are safer and more convenient than wireless models. You can use them indoor and outdoor and they will work perfectly without electricity. No training whatsoever is needed. On the other side, they allow only a limited amount of space and if you want a decent model, you should expect a large construction! The portable yard fence in question is made from a heavy-duty tube frame (1/2 inch). It has 8 panels, one of them used as a door. What we liked about this model are the simplicity and flexibility. As such, we have the ability to set the fence into different shapes, suitable for all dog-owners. Each panel is 40x31 inch, so it is suitable for dogs of different sizes. The pins are strong and long, meaning that they will keep the fence sturdy and secure. The total weight of the fence is 52.8 pounds. Don’t forget that you don’t have to use any tools to set it up, so this is the total weight you can expect to carry while traveling. We must add that the simplicity of the fence is suitable for elderly people and those who don’t have any knowledge regarding setting up the fences. Furthermore, the fence is durable and coated with a protective layer, so rain and moist won’t damage the steel. 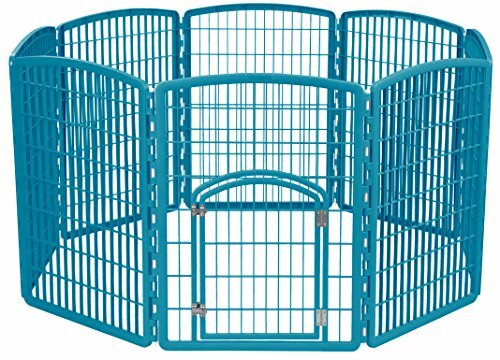 The MidWest Exercise Pen is a masterpiece in a small package. We were impressed how easy it is to set up the fence. With the 8 panels, all protected with a coating, 8 anchors, and 8 stabilizations, the fence system is stronger and more capable than it looks. It is originally designed for small dogs, but the variation in height allows you to choose the version which may be suitable for larger dogs. Addition: The manufacturer used e-coat finish, known for anti-rust properties. Maybe it looks small, but actually, this fence has 31.2 x 24.5 x 2.2 inches dimensions. It weighs 23 pounds (for the 30H model). Don’t forget that optional tops are available, but aren’t included in the price. If your dog is a jumper, consider getting the top. It isn’t expensive, but it makes the entire fence much better. 16 square feet of the inner area are probably sufficient for most dogs. Dog fences for outdoor usages do require some special additions. This model has all of them. First and foremost, it is made from high-quality metal, coated with an anti-corrosion coating. Then we have 8 panels, easy to set up and shape as you like. The superior anchor system makes the fence entirely stable and suitable for all dog breeds. As such, we highly recommend the fence for small, medium and large dogs. Dimensions are 72.8 in diameter, each panel measures 31.9’’H, 30.25’’W and the weight is 53 pounds. It isn’t the lightest model here, but don’t forget that it is a large fence, suitable for dogs who prefer plenty of space. Additional fact we must mention is that this fence is purely designed for outdoor usages only. Except for the shipping cost, which isn’t actually a drawback of the fence itself, we found none major issues with the unit. 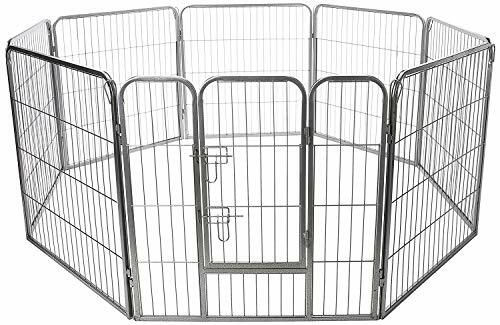 IRIS Playpen is a portable dog fence just perfect for indoor and outdoor purposes. It is made from molded plastics, but the strength is at the highest level. You may know that plastics cannot rust, so this playpen will probably last as long as you need it. 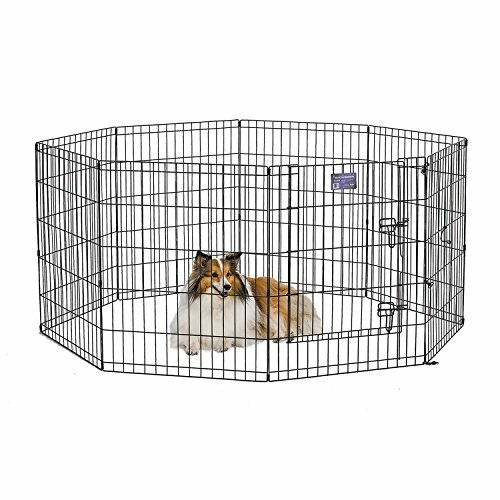 With 8 panels and 21 square feet of space, we will recommend it to dogs of all sizes. The dimensions are 62.99 L x 62.99 W x 34.25 H inches, so it is far from small. The weight is 26.2 pounds. Suitable for portable purposes. Flexibility is impressive no less. First, you get the ability to choose between different colors. An optional 2-panel addition is available and you can connect as many additional panels as you want. The same applies if you need a smaller fence. Remove a panel or two and you are done. This portable fence for dogs is all about the shape. You can choose between varieties of layouts and set up the fence within minutes. Obviously, it doesn’t require tools or special knowledge. The entire construction is made of metal and powder coated, meaning that it is fully weatherproof. It is essential because this model is for outdoor purposes only. Also, there are several pins to secure the fence in the ground. All pins are long and made from steel, so regardless of your dog and how strong he is, pins will hold the fence. Dimensions of the fence are 94.2 x 31.4 x 31.4 inches and the weight is 48.2 pounds. Probably the best application will be while camping, due to practicality and the strength of the fence. However, we found that it is perfectly useful for backyard purposes. An interesting fact is the assembly process, which is probably the easiest you can get today. Even modification and adjustments are simple and won’t take you more than a few minutes. 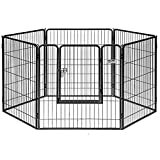 Here we have another dog enclosure which is completely different than most models available on the market today. It is made from aluminum, rather than steel. This has positive effects on the rust resistance (aluminum won’t rust) and it is lightweight. The 6 panels, compared to traditional 8 allow you easier assembly process, but don’t affect the space or practicality of the fence. There is no need in mentioned that this unit is made for outdoor purposes only. 36.6 x 38.2 x 4.7 inches dimensions and 64 pounds of weight are perfectly reasonable if you want this fence for large dog breeds. Included pins are longer than usual, so they ensure even better protection. Due to design, we believe that dog owners who seek for outdoor pet enclosures and/or dog RV fencing will think this unit is the best. We also liked the precision and the attention to details the fence system provides. A nice addition is a door for easy pet access. Of course, they come with a lock, which is a secure and heavy-duty element. The best portable dog fence is the one that suits your dog the most. All 6 models here are perfectly capable of meeting the demands of most dogs, so we will have to recommend them. 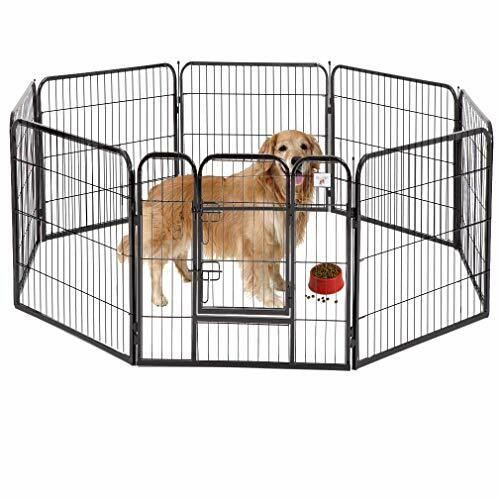 With these fences, your dog will be perfectly safe while still getting plenty of space for his activities and play. The-Hunting-Dog.com is a participant in the Amazon Services LLC Associates Program, an affiliate advertising program designed to provide a means for sites to earn advertising fees by advertising and linking to Amazon.com.